Choosing your outdoor lamps can be a fun and exciting experience. Understanding the characteristics of a lamp will help you choose the best lamps for your outdoor needs. What exactly is a lamp? For most people the first thing that comes to mind is a desk lamp, or an oil lamp such as the one a genie comes out of when you rub it. Now I know that outdoor lighting is magical, however the lighting field refers to various types of light bulbs as lamps. Since lamps come in all shapes and sizes, where do you start? A lamp's shape and size changes to accommodate it's light distribution, filament design, or arc-tube design. There are two basic categories of lamps to choose from: Filament Lamps and Discharge Lamps. Filament lamps are comprised of only one lamp type, incandescent. An easily recognizable incandescent lamp is commonly referred to as your typical light bulb. Discharge lamps are comprised of two categories, high intensity discharge (HID) and low intensity discharge. HID lamps are commonly used for commercial outdoor lighting applications. Find out more about HID lamps by clicking here on the commercial outdoor lamps link. Low intensity discharge lamps consist of outdoor fluorescent lighting, cold cathode, and neon lighting. Incandescent and HID lamps are identified by a lettering system that is followed by a number. The letters indicate the lamp's style while the numbers tell you the diameter of the bulb. The numbers to the right of the letter(s) indicates the diameter at the widest part of the lamp. The sizes are broken down by eights of an inch. For example, if you have a MR16 bulb you know that the bulb style is MR or (mirror reflector). You also know that the 16 indicates 16 eights of an inch. So 16/8 = 2. So you know that the fixture is 2 inches in diameter. Inside an incandescent lamp you will find a filament. 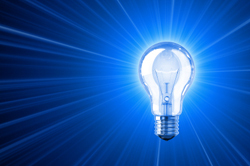 The filament is made up of tungsten which heats up when wattage is applied, producing light. Although tungsten has a high melting point and provides slow filament evaporation, over time the filament will fail. Filaments are designated by a letter system that helps distinguish each filament type, similar to that of an HID lamp. CC - is a coiled wire that is itself wound into a larger coil. Incandescent lamps come in many shapes and sizes allowing for a wide range of beam spreads to choose from. Because of their small filament light source, incandescent lamps have nice tight beam spread that can easily be controlled and focused on an object. Another type of filament lamp is the tungsten-halogen or quartz lamps. These lamps are filled with a halogen gas that surrounds the tungsten filament. As the filament burns, the halogen gas helps to re-deposit the evaporated tungsten back onto the filament. This process is called the Tungsten-Halogen Cycle. It enables the filament to burn at a higher temperature resulting in a whiter color and better efficiency than incandescent lamps. 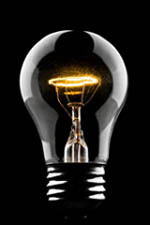 Halogen lamps have a longer life span than incandescent lamps when operated between 90% and 100% of their rated voltage. They are also very sensitive to shock and need to be treated with care when handled. Physical size and variable beam spread are important characteristics commonly sought after in outdoor lamps. The more compact the fixture the easier it can be hidden or blended into your outdoor lighting design. Mirror reflector lamps are especially good at going undetected because of their compact size. These lamps contain a lamp surrounded by a miniature mirrored reflector. Since MR lamps are Tungsten-Halogen Lamps, they are great for lighting plants as well as most other outdoor features. These lamps are very versatile and many outdoor lighting fixtures are available that will work with them. PAR lamps were originally designed for outdoor use. They have a heat resistant glass that is made to stand up to water and temperature changes. PAR lamps are often attributed to outdoor flood lighting because of their wide beam spread. They come in various sizes as well as many different voltages. The smaller PAR 20 and PAR 30 lamps contain air holes at the base of the lamp to help drain water that could possibly get inside and short out the lamp. The list goes on and on. With so many lamps to choose from and fresh new designs being invented all the time, it's never boring when shopping for outdoor lamps.